In a stamp issued in 2003 (No. 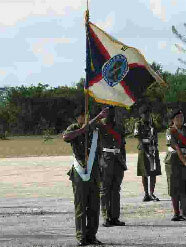 1268 - 25th Anniversary of Belize Defence Force), there is the BDF Standard. Source: Stanley Gibbons Stamps of the World. The emblem of the BDF is at <www.belize.gov.bz>, which also say: "The Motto is "Shoulder-To-Shoulder", it depicts unity within the organization. This means the BDF soldiers work and play together as a team. The Emblem, which is also the design for the Cap Badge and is also depicted on the Force Flag, is comprised of the mahogany tree with a crossed rifle and axe. The 'Mahogany Tree' represents Belize and its people, the 'Rifle' signifies the Defence of the Country and the 'Axe' represents Aid to Civil Power." With respect to the flag of the Belize Defence Force, I believe that it differs from the image on the stamp in that there is no lettering across either the top or the bottom horizontal bars, I think that they are a solid red all the way across. I had made an image based on the photo from offical website of Belize Defense Force. Obviously, main disc of the seal is light blue, ring with text is normal blue, flag areas are dark blue and white, saltire is red. The flag on the photo has also a fringe only at the top and bottom rim. I decided to draw diagonals touching vertical edges, taking the photograph as a main source for drawing main areas. Red diagonal, from top hoist to bottom fly seems to be even a bit "higher" then bottom-fly point. We have sources overlap here.